Crafty Pork's Food Explosion! : Holy Guacamole! After recently having some Mexican food in San Diego, I had a craving to recreate one of those culinary experiences. Specifically, I wanted to make some burritos that we picked up at Chipotle Mexican Grill. They were fantastic! I would definitely recommend eating there if you’re a Mexican fan. So I found myself with a problem. There was no guacamole at the supermarket where we are staying for the summer. So I had to make it. My favourite recipe database is at food.com. There you can search for anything and choose based upon a recipe’s popularity. The user feedback really helps you tweak each recipe based upon your tastebuds. 3. Mash the ingredients together to desired consistency using the back of a large spoon or a potato masher (some like the avocado chunky, some like it smoother). 4. Fold in diced tomato and diced onion, a couple pinches of salt, and the juice from the remaining lime half (Also add cilantro or peppers at this time). 5. Cover the bowl and refrigerate for 30-45 minutes. 7. Add salt as needed. 8. If you don't give the resulting guacamole at least 4 stars, then you ain't making it right. 9. 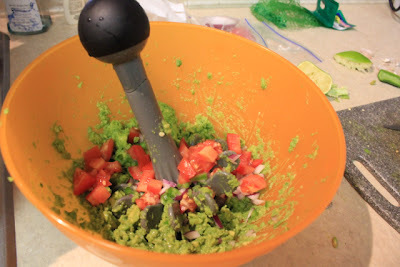 NOTE: The purpose of the lime is to allow any leftover guacamole to retain its "avocado" color as it sits in the fridge. 10. Some folks use lemon, but it's been my experience that if you accidentally add too much lemon, it seriously affects the guacamole's flavor; if you happen to add too much lime, the guacamole just gets a little more tangy. 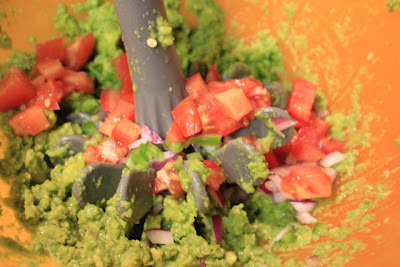 If you find the leftover guacamole has darkened, simply stir it before eating and use more fresh lime juice next time. The only changes I made were to leave out the cilantro (because it is nasty), add in one big jalapeno (bam!) and double the garlic (which just about quadrupled after a day in the fridge). It was really easy to make and turned out so delicious that we never even made burritos! It ended up being scooped up with some salsa and sour cream. You can’t miss with this one and it is easy to tweak. If you don’t like spicy and love cilantro, go for no jalapeno and the right amount of cilantro (don’t ever use too much cilantro – you can’t go back). If you like chunky guacamole, don’t mash your avocados too much and cut your ingredients into larger chunks. For you smooth fans, do the opposite. Use it in any dish or simply by itself. You’ll love it either way. Enjoy! NOTE: I strongly recommend making sure that your avocados are ripe. I tried making it a second time and it was a complete disaster because they hadn’t ripened enough. Absolutely no taste!